Start Menu 10 is a smart piece of software, so if you click "Cut" in the context menu of one program and then use the "Paste" command in another group, the program will simply move the program to a target group. Thanks to the context menu, you can use a simple trick – place a program into two categories at the same time (can be done for all groups except "Other"). To do that, click "Copy" and then "Paste" in a target group. If you want to move a program from one category to another, click “Cut” on step one. If you created a group in Tidy Start Menu, you can easily convert it into a virtual one. Just start Group Manager and from the program list drag the folder with the old group to the button Add Group. Start Menu 10 creates the virtual group itself and moves the programs to it. Note:This function is only available in the PRO version! Note: Under Windows XP the empty folders may appear after converting. 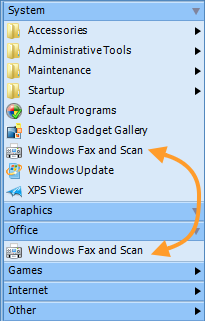 Please right-click over start button, select "Open All Users" and delete empty folders manually.